Holly's Blog Choosing MCN's, Developing shows on Youtube, Diego Torroija, Dry Humor, Feathers and Toast, Holly Payberg, Industry #3, Mhairi Morrison, Second City, Tallulah Grace, Television Deal, Television development, To Youtube or Not To Youtube, Youtube, Youtube as a development tool. permalink. An actual cooking show?? Ohhhh how misguided those industry types are! Thanks for sticking to your guns and following your creative hearts! Love you ladies, I’m always pulling for you! Great “casting” Diego is a natural! First have to say I agree with Bob Burns about a cooking show and the industry people being misguided! We love the combination of both! The cooking bit has to be there to show Tallulah’s expertise and her style and her serious delivery of such great comedic moments… but the behind the scenes is too delightful and where we see more of the real Tallulah! When you can… it would be great to know in the pilot format how much time is behind the scenes and how much time is the cooking bit? They should both expand in time. The choice to go to YouTube was brilliant and it’s a great way to be seen by many! It’s also very easy for people to watch and comment and engage with you. 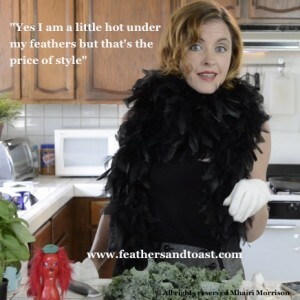 It definitely works better when you have a regular release schedule too so when you were releasing on Saturday’s it was easy to make a stop at Feathers and Toast’s site to catch the latest episode. Just like now we know you have a set release of blogs and vlogs! I know your numbers and engagements on your site, SM and YouTube will help with getting your pilot picked up because it establishes an audience. You are both doing wonderful things building your audience and we can’t wait for more! It was another insightful blog Holly and the industry tips are fun too! You must stick to your guns and have the behind the scenes… it is a great part of the total show! I am certain that you will get the break and that more people will get the pleasure of seeing Mhairi be Tallulah Darling… she’s just too brilliant not too! Would love to see Diego, you and Barbara in some upcoming episodes even if it’s just filming a reaction! Thanks Holly… well done again! With the TV show we will be spending nearly all our time on the Behind The Scenes moments as it will be a single camera comedy that follow the life of Tallulah and her rag tag team, Holster, Diego and Marge. “Tallulah’s cooking show” will continue to be on the web and we will make more episodes. Only if you can say… will you be referring to the web cooking show within the TV show? Will there be the link to Tallulah actually doing the cooking bit? Sort of a transmedia approach? Could be interesting and could still work even with the name differences? Thanks Holly! Great topic! Most definitely YouTube! Any creative video content should be there and elsewhere. Vimeo is great too! Having it on your website is a must too! We have learned with our Birthday video for Simon that YouTube with the right links will get you people that are not your current supporters, if done correctly! Love that you both are taking a stand and not compromising your vision and your product! That is so uplifting to hear… rather than taking the money and running. You have a very delightfully complex mix of talents in this show and someone is bound to see what we see and love! Interesting to hear that there will not be any cooking bit in the TV show. Will look forward hopefully to your next web season of seeing more of the behind the scenes characters in front of the camera! Well done Holly… love the industry tips! Look forward to seeing the next one! Thanks for the tip darling about vimeo. Why do you think its necessary to have vimeo on your website, is it an SEO situation? Thats interesting as we only have youtube, maybe we should upload to vimeo too and add that to our website. Thank you for sharing about the links in your birthday video (which I remember watching and loved, well done!) do you mean the tag words used when describing the video in youtube or do you mean annotations within the video itself? I’m still grappling with all of this with the vlogs and would appreciate your insight! Thank you so much. I am so inspired by Chanel and her uncompromising vision that we often say we are Chanel and not H and M. With a lot of art people don’t necessarily ‘get it’ straight away…even Manet and Monet weren’t accepted into the Academy of Beaux Arts and were considered outcasts when they began… Thank you for the vote of confidence, I hope you’re right! There maybe some sandwich making in the half hour show darling Tallulah is Queen of the Cuisine afterall…we shall see! Thank you again so much for watching and commenting, so glad that we have met, even if it is simply in the virtual world!